The tissue half-life is always 4 days, regardless of how much vit. C you have loaded your skin with. This means that after about three days it starts to be a good idea to re-apply one application. Let`s say your skin has 256 mg/kg vit. C in it. After 4 days, it only has 128 mg/kg, after 4 more days 64 mg/kg, after 4 more days 32 mg/kg etc. The same formula applies with any number of applications, serum strengths etc. So, if you start with less vit. C because you had applied less often, initially you would have for ex. 64 mg/kg, 4 days later 32 mg/kg, 8 days after initial application 16 mg/kg etc. Dermarolling / Microneedling / chemical sunscreens and dermarolling? As long as you avoid strong sun exposure longer than a couple of minutes, you`ll be OK. I'd use a mask once a week, but I advise trying it first after dermarolling with 0.25 mm needles first, because the concentration of peptides is high in our facial mask and redness is to be expected. I'll add this to the instructions. Very much research has been done on the potential danger of chemicals used in makeup products, especially chemicals that work as hormones in the body and can contribute to breast cancer etc. It is not within the scope of microneedling to understand the processes of skin absorbtion of intact skin, so I'm afraid I can't help you there. But in general I can tell you that the absorbtion of chemicals into the skin depends on their water- and fat-solubility, the size of their molecule, whether they are ionized, how long they are applied etc. So, no general rules can be given. All chemicals have wildly different skin penetration characteristics and I am sure that a lot of the marketing is just hype. It could be theoretically possible that certain manufacturers of certain "skin penetrating" creams add solvents such as DMSO. That would increase penetration for certain chemicals. Not soon, but we will order some and add them to the store. It will take at least one month though. So don't hold your breath - feel free to order elsewhere - it may take quite a bit longer than one month too. Yes, the skin on the arms is thinner than that on the legs. It is impossible to sell a universal length needle that fits every skin condition and every part of the body, because firstly: Skin thickness varies significantly, depending on what part of the body it covers. The thinnest skin is on the eyelids (0.5 mm or less) the thickest is on the soles of the feet. The back and the buttocks have thick skin as well. Secondly, it also varies individually. We have customers that roll their face with a 2 mm roller and they get no pinpoint bleeding and we have customers that roll their face with 0.5 mm and they get quite some pinpoint bleeding. And men usually have thicker skin than women. I am really sorry it caused you bruising on your arms but the good news is that the release of blood may infact improve your stretchmarks. You caused a microwound to the skin, the body will fix it and fill the microwound with new skin. That is the principle behind dermarolling and in fact, the literature suggests that blood plasma helps with this process. Do not get me wrong. You do not have to cause bleeding in order to improve the stretchmarks but apart from the cosmetic problem of being bruised, you do not have to worry too much about it either. Some surgeons even use dermarollers with 3 mm needles. We can even order those for our customers. You should not needle deeper than occasional pinpoint bleeding but the line between pinpoint bleeding and getting bruises is a fine line and it is difficult to guess.the best is to try a small patch first. Our needles have a "safety stop" at around 2 mm, but some needles are longer than others, so that you can choose which one suits a particular skin area best. You should not always put the needle in until it can't go any further - not on thin skin in any case. The skin consists of the epidermis, the dermis and the subdermis (fat layer). The epidermis has no blood supply at all. If you get pinpoint bleeding it means you reached the dermis. The dermis has irregular tiny blood vessels and the deeper you go into the dermis, the more blood vessels there are. If you reach the deeper parts of the dermis where there are many bloodvessels, you could end up with bruises. Stretchmarks reside in the dermis. As said, skin thickness is not the same all over the body, unfortunately. The "toothpick solution" is not ideal but it's the best we found so far. So, next time when you needle your arms, use a toothpick to make it shorter. We are trying to improve our products to our customers' needs and I hope we can find a better solution. As I explained, it is impossible to sell a universal length that would be perfect for every condition and every customer. We still haven't found a needle manufacturer that can produce the perfect needle in a range of perfectly accurate lengths in the mm range. I hope next year we will have found such a supplier, but the current needles are in fact very good already, as long as you are aware that for some skin, they are a bit too long and should be either not pushed in to the hilt, or shortened with a taped toothpick to the shaft. Regarding bruises: You can use a cream containing heparin (available OTC in pharmacies), which will make the bruises disappear quicker. Do not apply Heparin cream immediately after needling (do not use it on "open" skin). Wait one day. Haley I am sorry you got bruises! Hopefully you'lll be rewarded with a solid improvement of your stretch marks. We've asked for a price and a minimum order was 660 tubes for 9000 USD, ex. VAT, ex shipping. So I guess the answer is "no, for the time being". We never understood why those "face masks" were so cheap compared to copper peptides, now we found out - they are not what we expected to be - cream - but physical masks with holes in them.. So if it's not mainly the face you want to improve, it's best to buy a tube of copper peptides somewhere else, sorry.. If it's the face that needs the most attention, then our masks are the best available today, due to the plethora of other ingredients such as vitamins B.
Fortunately, there are no restrictions regarding flying and micro-needling. All that happens in an airplane is that the air pressure is a bit lower, such as at a moderate altitude on Earth. And you may have some impaired circulation. Nothing that affects the skin, neither does microneedling bring for ex. gasses into solution in the blood, as with diving (divers can't fly after a deep dive). Dermarolling / Microneedling / Losing weight and Dermarolling body parts (during or after)? A relief to read your full question because when I read the title, I thought it was about dermarolling as a weight loss method which of course doesn't work.. When I read those claims on how dermarolling will reverse gray hair, make stretchmarks and cellulite fully and quickly disappear and so on, I get frustrated because when people have unrealistic expectations, they will be disappointed. I always try to inform our customers to the best of my ability, and of course I don't know everything. 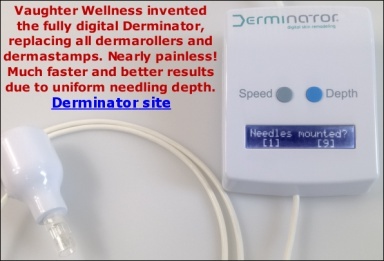 Dermarolling is a relatively new method and many aspects of it are not yet fully clear to anyone. Regarding your question: It is OK to roll during weight loss. No problem. What is very important is that you do not fluctuate too much in weight. Significant weight fluctuations usually causes stretchmarks and the skin´s elasticity suffers. As to stretch marks: It is better to be steadily overweight than going frequently very much up and down in weight. So if you might not be able to keep the lost weight off, then better think twice about losing a lot of weight because if you gain it back you might end up with more stretchmarks. We have received the copper peptide facial masks. They are non-comedogenic. We sell the GHK-Cu facial masks for just 3 dollars, and they are excellent after dermarolling the face with needles of any length. The facial mask is applied after dermarolling. When your face has dried, you can apply Infadolan ointment to selected spots. Our masks contain 2000 ppm GHK-Cu/a>. [url=http://www.owndoc.com/dermarolling/copper-peptides-for-dermarolling/]GHK-Cu is the best copper peptide for skin rejuvenation and collagen regeneration. The rest is deionized water. It is found that in poor connective tissue conditions, the triterpenes in<strong> Centella asiatica</strong> are able to renew the collagen, in quantity and quality, and restore tissue firmness and skin elasticity, improving skin appearance and comfort. Apart from this it also has anti-psoriatic properties. was published promoting the use of pantothenic acid to treat acne vulgaris. transepidermal water loss and maintaining skin softness and elasticity. effect on experimental ultraviolet-induced erythema. reduction in erythema, and more elastic and solid tissue regeneration. is well tolerated, with minimal risk of skin irritancy or sensitization. You can give it a try. The problem is that after needling, the iodine will penetrate deeply and some of it will likely get into the blood stream. Iodine, just like any other toxic element should not be overdosed so Lugol's solution should not be put on extensive areas or for a very long time, especially if you apply it after needling. Try it on a small area. Iodine is used to disinfect wounds so it is OK to use it for its intended purpose, but I would not recommend prolonged use on large "open" areas, since Iodine is a toxic halogen. Then again, many, if not most people have an Iodine deficiency, and Iodine protects against heavy metal accumulation and many other serious problems. Iodine is one of the most important elements for our health. So as long as you don't overdo it, you should be fine.